The National Association of Convenience Stores predicted that healthier options would be one of the industry’s biggest trends for 2018, and just a week into the new year, America’s largest convenience store chain is helping to prove them right. 7-Eleven has announced its introducing its own line of USDA-certified organic, cold-pressed juices as part of its 7-Select GO!Smart line of better-for-you products—and at a price intended to drag you away from favorite trendy juice bar. 7-Eleven attempted to check as many boxes as it could with these new private-label drinks. Beyond being organic, each of the four varieties also promises to contain certified fair trade, Non-GMO Project verified, 100-percent fruit and vegetable juice, not from concentrate, with no additives and no added sugar. And at a suggested retail price of only $2.99 for a 14-ounce bottle, these new juices are priced to move. 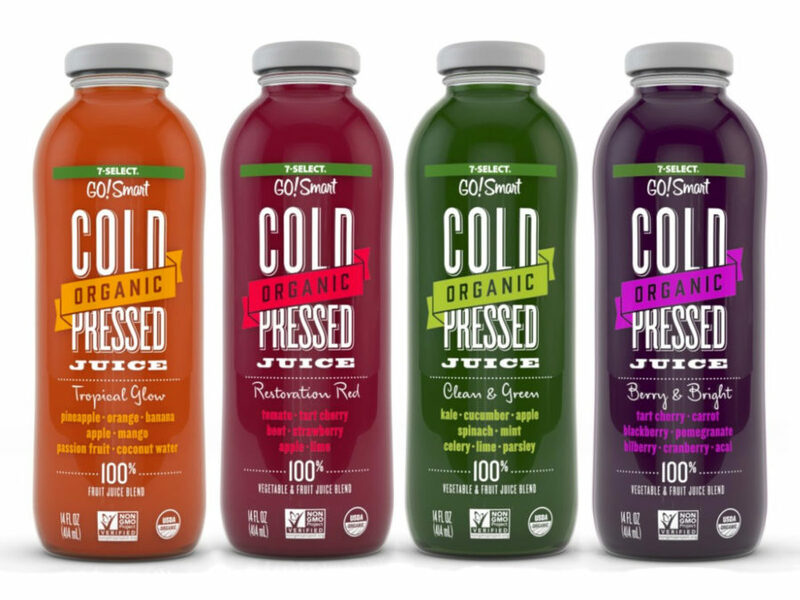 “When you compare this new line of 7-Select GO!Smart cold-pressed juices head-to-head with nationally recognized premium juice brands, well, there is no comparison,” Tim Cogil, 7-Eleven director of new product development, boasted in a statement. The four juices, which can be found in the refrigerated section, are Clean & Green (made with kale, cucumber, apple, spinach, mint, celery, lime, and parsley), Tropical Glow (made with pineapple, orange, banana, apple, mango, passionfruit, and coconut water) Berry & Bright (made with tart cherry, carrot, blackberry, pomegranate, bilberry, cranberry, and acai) and Restoration Red (tomato, tart cherry, beet, strawberry, apple, and lime). These cold-pressed juices are only the latest announcement from 7-Eleven as the chain continues to attempt to up its food and beverage game. In September, the chain announced that it would be testing “restaurant-quality” meals in hundreds of locations. Granted, it’s unlikely that 7-Eleven will reach the same cult-like status of a chain like Wawa anytime soon, but the biggest name in the industry is certainly trying to reinvent itself.